Herold & Lanchbery's most celebrated recording! "Analogue Productions has followed up on their highly acclaimed series of 25 RCA Living Stereo SACDs with a smaller group of 9 Decca SACDs. ... La fille mal gardée as conducted and arranged from the music of Ferdinand Hérold by John Lanchberry should be a delight for any music lover with even a remote interest in ballet. This Decca recording is a true audiophile legend, so its appearance on an Analogue Productions SACD should be an important event. It has never sounded better than it does here." — Arthur Lintgen, The Absolute Sound, February 8, 2019. Read the entire review here. Frederick Ashton's Royal Ballet production began in 1959 when Ashton, the British dancer and choreographer, created a new version of La fille mal gardée for the Royal Ballet of London. John Lanchbery was an English conductor and composer famous for his ballet arrangements, especially those for The Royal Ballet. Lanchbery was principal conductor with The Royal Ballet for 13 years starting in 1959. 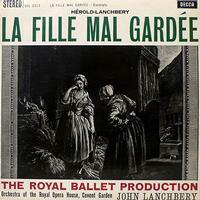 Undoubtedly, Lanchbery's most celebrated recording — in both a highlights and later a complete form — is of his music for Ashton's La Fille mal gardée. The French composer Hérold usually takes all the credit, but Lanchbery's selection is far more elaborate than that attribution might suggest. Herold was a French opera composer, now best known for the delightful ballet score for La Fille mal gardée (1828). Born just over a year before Rossini, he did much to make ballet music more important in its own right; at the time it was the norm to to make ballet scores entirely out of existing opera melodies and popular tunes. Louis Joseph Ferdinand Hérold, to give him his full name, is only one of at least half a dozen composers whose music went towards giving La fille mal gardée as we know it today its special flavor. The performance here is brilliantly played, displaying both affection and sparkle in ample quantity. Recorded in February and March 1962 in Kingsway Hall.